In early 2018 sessions we will continue to further develop the wildlife scrapes and improve access with the new footpath. 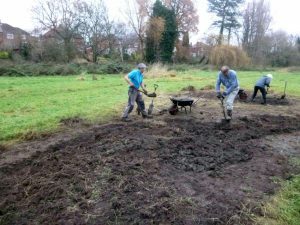 This work day is part of our York Becks Project, which includes restoring the wetland meadow at Heworth Holme. Our aim is to make this valuable green space more colourful and attractive for both the local community and wildlife. Heworth Holme is a remnant of old countryside in the town, protected from development by its regular winter flooding and part of a wildlife corridor between St Nicks Nature Reserve and other green spaces along the Tang Hall Beck. These events are funded thanks to Lord Mayor 2016-17’s fundraising and by the York Flood Appeal Fund managed by Two Ridings Community Foundation. It is part of our York Becks Project.